A few showers early, becoming a steady light rain overnight. Low 49F. Winds SW at 5 to 10 mph. Chance of rain 70%..
A few showers early, becoming a steady light rain overnight. Low 49F. Winds SW at 5 to 10 mph. Chance of rain 70%. Walt Postlewait/For The Daily Astorian Astoria High School students Leo Matthews, background, and Michael Postlewait, doing what they love. Walt Postlewait/For The Daily Astorian Bobby Brown of All Star Bass Fishing, center, stands with Astoria fishermen Leo Matthews, left, and Michael Postlewait. 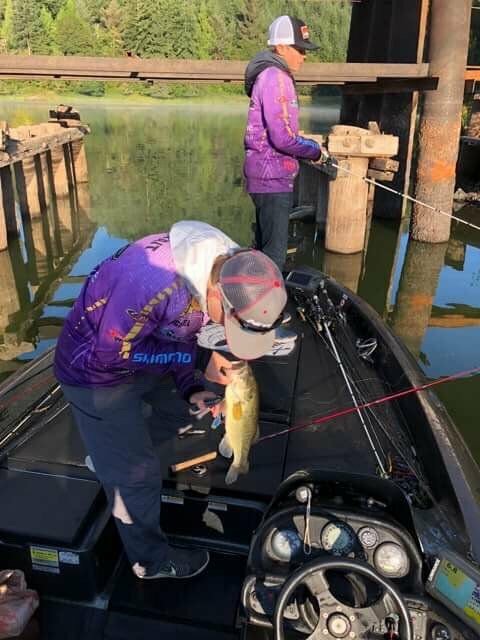 COOS BAY — Astoria High School’s bass fishing team of Michael Postlewait and Leo Matthews finished third recently in the high school bass fishing tournament on Tenmile Lake, north of Coos Bay. Teams from Thurston and Banks, newcomers to the 2018-19 championship competition, finished first and second, respectively, with five fish bag weights of 11.21 and 10.38 pounds. Westview, winner of the previous tournament on Siltcoos Lake, was fourth. Astoria caught six fish on the day but only weighed four. Matthews said, “Our next two events in the spring will be on the Columbia (River), and we have had good luck with smallies (smallmouth bass). Last year our best tournament was out of The Dalles,” where the team secured the 2018 state championship. Bobby Brown of All Star Bass Fishing took the Astoria team out after their boat experienced mechanical problems earlier in the week. This is the second season Astoria has fielded a team to compete in statewide championship series hosted by The Bass Federation of Oregon. There will be a total of four events in the 2018-19 season, with the next tournament held on Celilo Pool on the Columbia River April 13. The season concludes May 11 at Cascade Locks.